Can Ferrari find some trump cards? 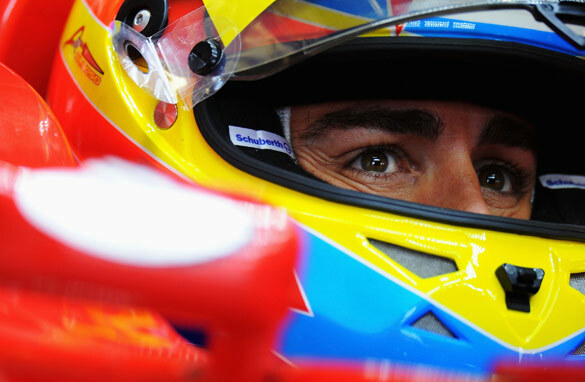 Can Ferrari's Fernando Alonso vie for a win in Malaysia on April 10? The opening race of the Formula One season is always an interesting contest as it is the first time the teams on the grid show their hands in the poker game of speed and potential. Pre-season testing, as fascinating as it is for F1 aficionados, often sees as much bluff and smokescreen from the competing constructors as it does commitment to putting new designs and innovations through their paces. One team a few seasons back, when struggling for sponsors, tested with the minimum fuel possible throughout the build-up to the season. The test times were rapid, the team caused a buzz and sponsors came on board. It was only when they filled the car up for their first race that the true, less-than-lightning pace was revealed in the heat of battle. Poor cards, but ultimately, a hand well played. This year Red Bull certainly kept their muscle flexing for the main event, as the chip leaders returned to aggressively reclaim their territory with world champion Sebastian Vettel continuing in Melbourne where he left off last season. McLaren were clearly worried beforehand - as they were two seconds off the front-runners in the days building up to the Australian Grand Prix - but they bluffed and were relieved when their gamble to fit and race a new exhaust paid off in dramatic style as Lewis Hamilton finished second. Renault too had cause to celebrate a good return from their punt on a creative, front-facing exhaust system which put them on the money and gave Vitaly Petrov his first podium placing. One team who might be wanting a fresh deal, however, are Ferrari. Their camp was confident when testing in Jerez, having come so close to clinching a third drivers' title for Fernando Alonso last season. The car looked great and Alonso and Massa were buoyant, but revelations that the Prancing Horse had approached the brains behind Red Bull, Adrian Newey, to join their ranks maybe alluded to the true nature of their hand. There is no hiding that a fourth-place finish for Alonso and a seventh, Sauber-assisted, place for Massa was hardly the glory Ferrari were hoping for. Expectations had been raised last season among the team's passionate and numerous Tifosi global support as Alonso's title challenge went to the final race in Abu Dhabi. Few teams have the pressure to deliver results and live up to a brand as prestigious as the Italian marque. But what can be done if you do not have the cards to win? Well, twist. Or more precisely, work hard on new ideas and improvements - more speed must be found. Consequently, the pressure will be on in Malaysia for both Ferraris to be back ready to instill fear into their opponents on the track instead of drawing complaints from the likes of Jenson Button that he had been held up by the "oh so slow" Italian team. Speaking to an F1 test driver, it seems reliable information that each team will improve their cars by about three seconds a lap over the course of the season. Ferrari will be hoping they can find some aces up their sleeve to start mounting up some winning plays soon. Ferrari are lacking answers right now, but to be fair compared to Red Bull EVERY team is. Even McLaren never really challenged. The sad fact is that Ferrari can and will improve, but it is likely that all they can do is factor into the McLaren vs. Renault feud, rather than legitimately threated Red Bull. While it is true Alonso came close last year, the door was held open by a litany of Red Bull mistakes and travesties...mistakes that I do not expect to be repeated this year. Ferrari still haven't replaced that dream team they had of Brawn,Todt,Byrne with Schumacher driving,unbeatable from 2000-2004. Domenicalli is a poor team principal,some terrible strategy calls in the last 3 years and until they get a top class designer like Newey,They will not win any titles and for a team like Ferrari that is just not good enough. They have a very good driver in Alonso for sure and can outperform the car but won't win the title if the pace of the car in Australia is a true indication of there pace. Last year Red Bull did not win the Driver's Championship, Ferrari (and not the driver) lost it due to a wrong tactic. It won't happen again...Red Bull is still unbeatable in the classification race but in the race itself all three are tight. Ferrari will improve. Red Bull is at the top of its performance and may stay that way but it's likely not to improve. Let's see what McLaren does. I'm reading about an alliance between Murdoch and an italian company , Exor, to buy F1 rights. but a detail is missing in the news.